There I was the other day, merrily minding my own business playing with Tableau maps when I happened to read this tweet by @KirkDBorne. Did a bit of googling and came across this link regarding whether you should call yourself a “data scientist” or not, a subject that seems to be getting a fair bit of chat at the moment. Now I think it’s a bit strong to refer to someone as a “fool” for calling themselves a data scientist. What companies like Alteryx, DataSift & Tableau have done with their splendid applications, is allow everyone to be a data scientist. Or whatever else you want to call yourself. I call myself a Ninja – believe it or not I’m not a real one, although I do have a black one-piece. What I am is a real scientist. I’ve got an M.Sc. degree in Molecular Pathology (and toxicology) and a B.Sc. in Biomedical Sciences. None of that matters, I don’t get offended when someone next to me calls themselves a data scientist. For me being a scientist is a mindset, not a qualification. It’s the mental attitude and aptitude to take on and solve problems through a process of hypothesis and experimentation. Your weapon of choice may be a bunsen burner or a Flow Cytometer or Tableau Desktop – it doesn’t matter. What matters is the desire for knowledge and understanding, even better if you’re of the mindset that you want to share it with everyone afterwards. The process of scientific experimentation is what has driven invention for hundreds of years. It doesn’t even matter that you don’t get the results you expect – it’s the journey that counts. 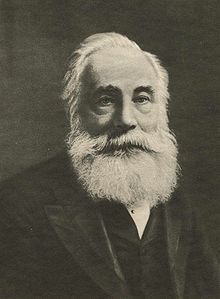 William Perkin (pictured) was trying to make synthetic quinine and ended up revolutionising dye making (and making a shed load of cash in the process). He also had a pretty impressive beard as well. Wonder if he dyed it… Even some items as seemingly complex as the human pacemaker was invented by accident – Wilson Greatbatch taking that one down. Other examples of accidental discoveries include the microwave oven, Teflon and Coca Cola. So call yourself whatever you want. Call yourself a Ninja, or a Jedi or a Yeti or a data rockstar. I don’t care. Just keep on pushing the boundaries and discovering. You should be proud of yourself for trying. This entry was posted in Opinion and tagged alteryx, bi, data, datasift, jedi, ninja, science, tableau, visualisation by paulbanoub. Bookmark the permalink. Great post! I certainly don’t consider myself a data scientist. When I hear that term, my bias tends to equate it with statisticians or actuaries. Someone with advanced degrees and certifications. But I like how you express it as a mindset….a way of life even. After using Tableau for years, and as new user of Alteryx, I like to think of myself as a data enthusiast. Maybe I’m a just a nerd, but it’s a great feeling to discover insights from untapped data. Thanks for the post.